Deploy, monitor, backup and scale MongoDB in a Private Cloud through your own custom controller version. Protect your data with a bulletproof, on-premise infrastructure. Reduce IT consumption and pay only for the capacity you actually need. Equip your IT team with advanced database management tools. Get the flexibility of the cloud with the advanced control of your own data center through our advanced ERP software. Analyze database ops with debugging and tracking tool. Create and customize unlimited alerts on any database metric. Keep disks compact with rolling and on-demand compression. Scheduled and on-demand backups with one-click restores. SSD-based instances for high write throughput clusters. Keep on top of your databases with advanced monitoring tools. Deploy MongoDB on private cloud and hybrid cloud environments with the only database as a service (DBaaS) platform that lets you manage both public clouds and on-premise from a single console. All environments are completely customizable and controlled exclusively under your administrative access. 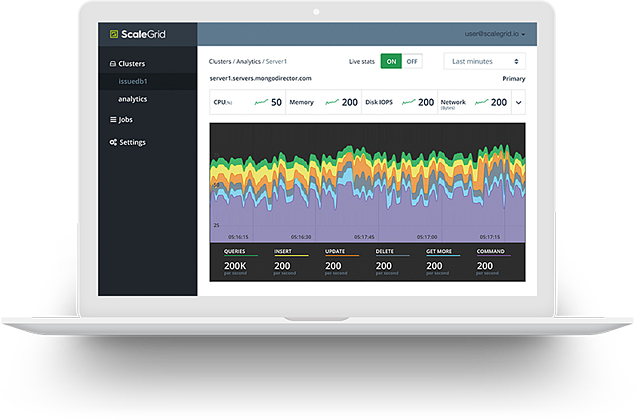 The easiest way to deploy, monitor, backup, and scale MongoDB on AWS.